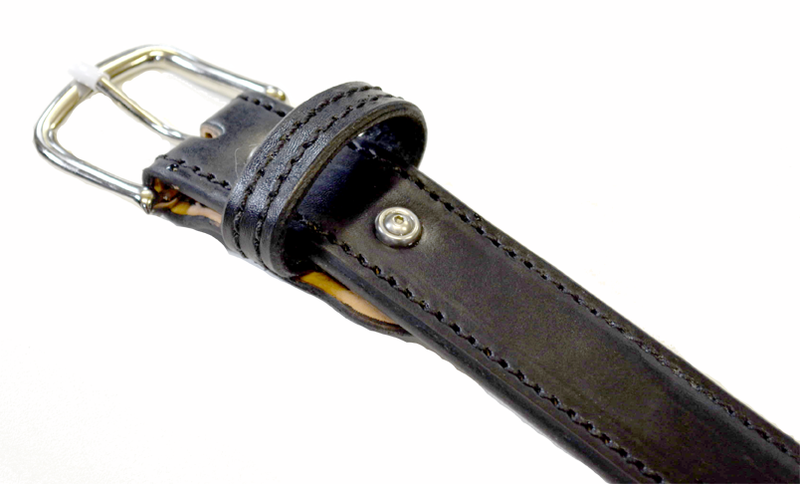 These are the most rigid, durable CCW belts you will find, anywhere. 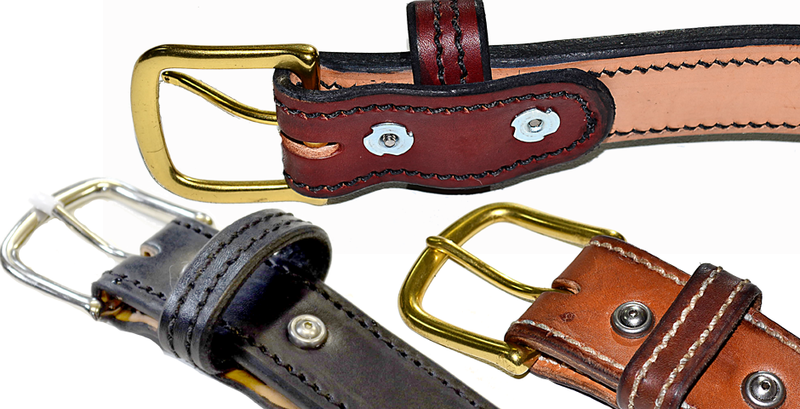 We make them in three thicknesses: dress-belt thin; standard (about 1/4"); and heavy duty (about 5/16"). The tongues are thinned on the heavy duty belts belts for easy buckling. Even the thinnest ones are more rigid than most commercially made gun belts. 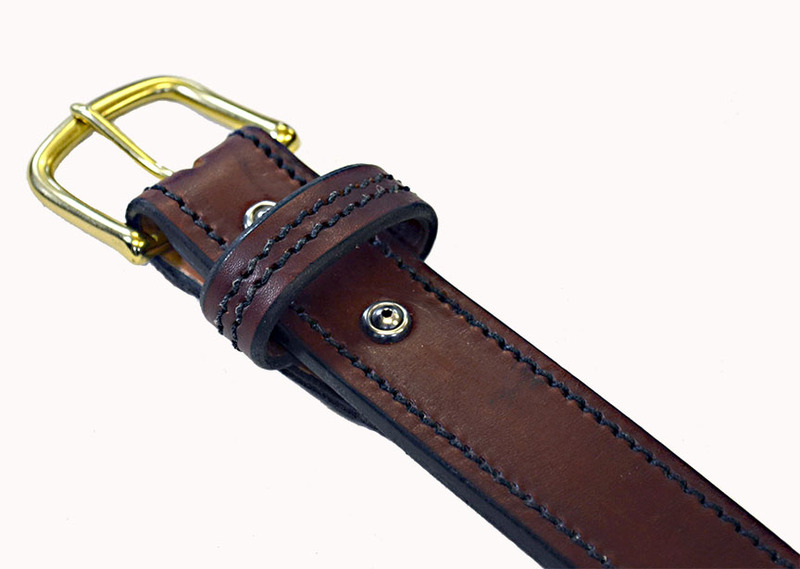 The top is bridle leather, a waxy, weather-resistant cowhide developed for horse tack. The bottom layer is vegetable-tanned cowhide. Because the color is added-in during the tanning process, it's deep and colorfast. It won't stain your clothing and scratches won't show white underneath. A strip of Kydex thermoplastic is sandwiched between the leather layers to create a rigid belt that will stay rigid for years under the heaviest usage. Steel can be used instead of kydex on request. Natural horsehide and alligator may be available on request. Buckles are available in heavy-gauge solid brass or nickle-plate. They are attached to the belt via screws that enable you to easily swap out the buckle. Standard belts are punched with five holes, one-inch apart. To get a correctly-sized belt, take a belt you currently wear and measure it from the knuckle (where the buckle attaches) to the hole that you currently use. 1.5" three-layer belt, either thin or medium, in premium alligator, up to 49," $500 if available. For embossing your name (Custom Made for John Doe) add $10.